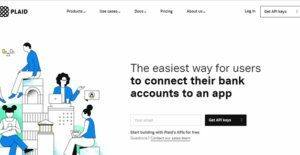 Application development software Plaid is designed to allow applications to connect with the bank accounts of users, providing them with access to banking data while reducing risk and validating ownership of such accounts. It helps financial services leverage technology without requiring users to undergo steep learning curves. The interface of its front-end module is clean and simple to use with ease-of-use defined depending on what project you are working on. The app comes in three modules–Auth, Assets, Balance, Identity, Income, and Transactions. Each product enables access through a single integration and generates data to be used in improving end-user experience. Built by developers for developers, it streamlines the way apps connect to bank accounts. What’s unique about the platform is its ability to build developer-friendly intelligence applications and software infrastructure, allowing app developers to come up with innovative solutions to business problems. What makes it even better is that it has partnerships with thousands of US- and Canada-based financial institutions like credit unions and regional banks. These partnerships allow users to link the apps to their financial information. Accuracy of financial information offered by the platform is guaranteed as the app is a certified asset verification provider for the validation service of Fannie Mae’s Desktop Underwriter. This information is the result of robust integrations with both large and small financial institutions, accomplished through an API. You don’t have to pay anything upfront when you use the platform’s core features and live set of API keys. The development environment is available for free for your first live accounts. Furthermore, you can generate unlimited Sandbox items as needed. Once you’re ready, that’s when you can choose to upgrade to a production-level account. Plaid is designed for use by app developers, making it but natural for it to be deployed with ease. Setting up the solution is a breeze, all it takes is a few lines of computer codes and you’re good to go. For app developers, the solution offers the ability to come up with applications that come with accessible user experiences. This makes the app popular among millions of users in the United States alone. This is made possible by Plaid’s ability to adapt to whatever app is being developed. Getting a clear picture of the financial health of users can be cumbersome at times, especially when it involves multiple financial institutions. With Plaid, users can consolidate information from numerous financial sources and makes them easy to use as transaction data are categorized. For organizations, financial management can be a tedious undertaking with processes more often than not proving to be complicated not only for staff but for customers as well. Because Plaid allows you to connect bank accounts to applications, it effectively slashes time spent on financial management. Allowing consumers to pay through EFT or ACH is far cheaper than using credit cards but can be problematic when it comes to signing in not to mention authentication. The platform makes setting up ACH payments a lot faster while focusing on security and the provision of user experience. All you have to do is enter users’ credentials and their accounts are authenticated in an instant. It offers a mobile-optimized flow that makes the transactions more efficient and lowers NSF and overdraft fees. Plaid gives you a product that empowers you to verify user identities according to their bank files. In each account, you can collect names, addresses, email and phone numbers information so you can personalize the forms when linking accounts. Transaction data can be accessed from thousands of financial institutions and up to 24 months. Aside from the transaction history, you will also get updates on recent transactions to help you gain insights to use for improving the user experience. Your account balances are verified in real-time with the use of Plaid’s Balance product. This allows account pre-funding and decreases fees accumulated from NSF and overdrafts. Asset Report is generated so you can view the account holder identity information, transaction history, and account balances. Since the software directly integrates with your digital loan application, you can mitigate risks using bank data and optimize the borrower experience with time-saving processes. Validating user income and employer information with accuracy is accomplished through a comprehensive bank deposits analysis. It streamlines the projection of annual income for the current year through historical income and leverages employment validation. What Problems Will Plaid Solve? 1. Problems With ACH Authentication. Although ACH payment is way cheaper than using credit cards and allows for direct funds transfers, sign in and authentication problems come with the process. With Plaid, you can accelerate setting up of ACH payments through a process that takes into account both transaction security and user experience. All users have to do is enter their bank credentials and the system authenticates the account automatically. 2. Problems With Account and Transaction Data. It is true that account and transaction information can be unpredictable at times as there are thousands of financial institutions, complicating the process of reliable applications, not to mention the fact that accessing such information presents its own challenges. Plaid’s custom integrations get rid of these complications by pulling, parsing and presenting account and transaction data in an easy-to-understand format. 3. Poor Borrower Experience. User experience from traditional bank statement uploads is notoriously poor. Not only that, this manual process is labor intensive and comes with but partial context. The app’s fully integrated solution offers borrowers a faster, streamlined experience, and lenders with a consolidated report that is used to verify assets and account holder identity. If you are interested in Plaid it may also be sensible to check out other subcategories of Best Application Development Software listed in our database of SaaS software reviews. Since each company has unique business needs, it is advisable for them to abstain from looking for a one-size-fits-all ideal software application. Needless to say, it would be pointless to try to find such a platform even among popular software solutions. The smart thing to do would be to catalog the various important elements that require consideration such as key features, budget, skill levels of workers, company size etc. Then, you should do your research thoroughly. Read some Plaid reviews and check out each of the other systems in your shortlist in detail. Such comprehensive homework can make certain you reject ill-fitting applications and select the app that provides all the aspects you need for business success. We realize that when you make a decision to buy Application Development Software it’s important not only to see how experts evaluate it in their reviews, but also to find out if the real people and companies that buy it are actually satisfied with the product. That’s why we’ve created our behavior-based Customer Satisfaction Algorithm™ that gathers customer reviews, comments and Plaid reviews across a wide range of social media sites. The data is then presented in an easy to digest form showing how many people had positive and negative experience with Plaid. With that information at hand you should be equipped to make an informed buying decision that you won’t regret. What are Plaid pricing details? What integrations are available for Plaid? Plaid’s account authentication product called Auth works with over 1,500 institutions and fintechs with a coverage equivalent to more than 85% percent of bank accounts connected via Plaid, including hundreds of credit unions and community banks. If you need more information about Plaid or you simply have a question let us know what you need and we’ll forward your request directly to the vendor.